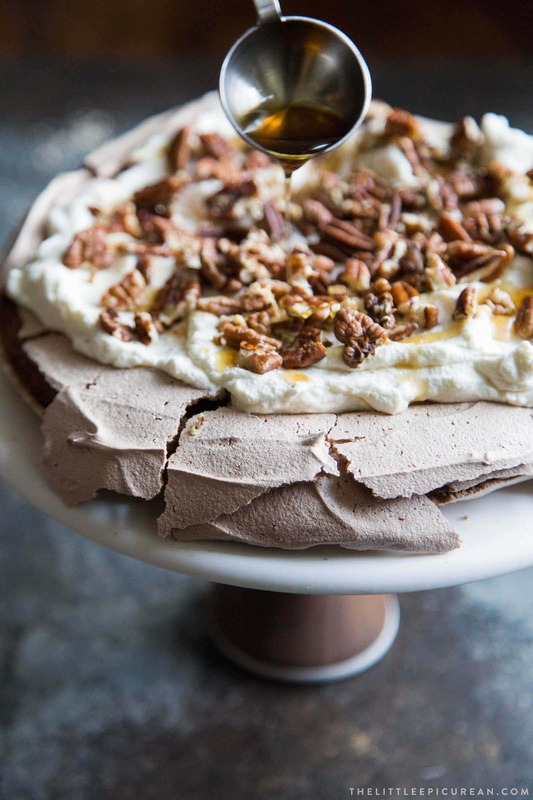 This chocolate pavlova is an autumn version of the traditional pavlova. It is a delicious and delicate dessert that simply requires a handful of ingredients. Sometimes I fail, sometimes I succeed. Along the way, I’ve learned a lot of do’s and don’ts. I made this chocolate pavlova three times successfully. That’s a feat and a miracle. Pavlova is a delicious and delicate dessert that simply requires a handful of ingredients. It is a meringue based dessert named after the Russian ballerina Anna Pavlova. It’s a mound of meringue that is baked until dry and crisp on the outside, but remains soft and marshmallow like on the inside. It is usually topped with whipped cream and berries. This is my autumn take on the classic pavlova. 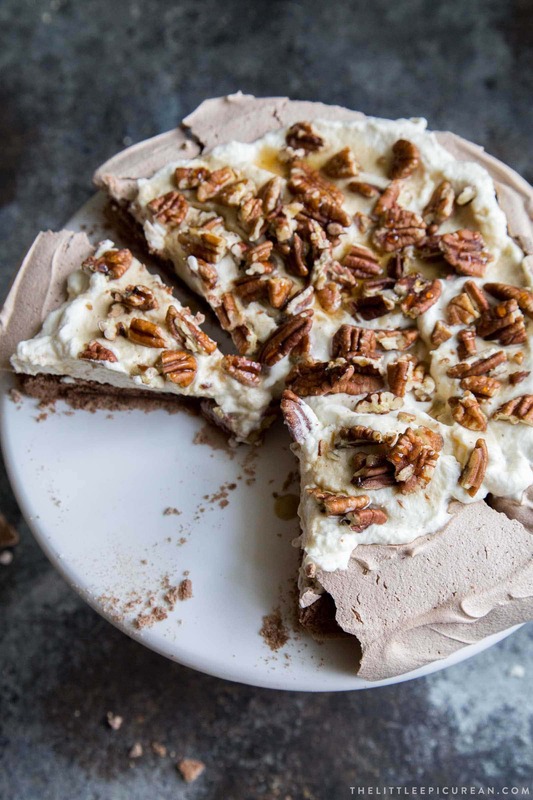 The chocolate pavlova is topped with maple sweetened whipped cream and a generous serving of toasted pecans. Egg whites are the most important part of a successful pavlova (any pretty much any meringue based dessert). Make sure the egg whites are free from any traces of egg yolks, oils, or any other contaminants. Eggs are easiest to separate when cold. Once the egg whites have been separated, it’s best to let it warm to room temperature. Room temperature egg whites whip better and stronger. The egg whites are beat to stiff peaks and then sugar is gradually added. Once all the sugar is in the mixture, continue beating to stiff peaks like photographed above. The meringue should be stiff, glossy, and thick. You should be able to invert the bowl of meringue upside down without it falling out. 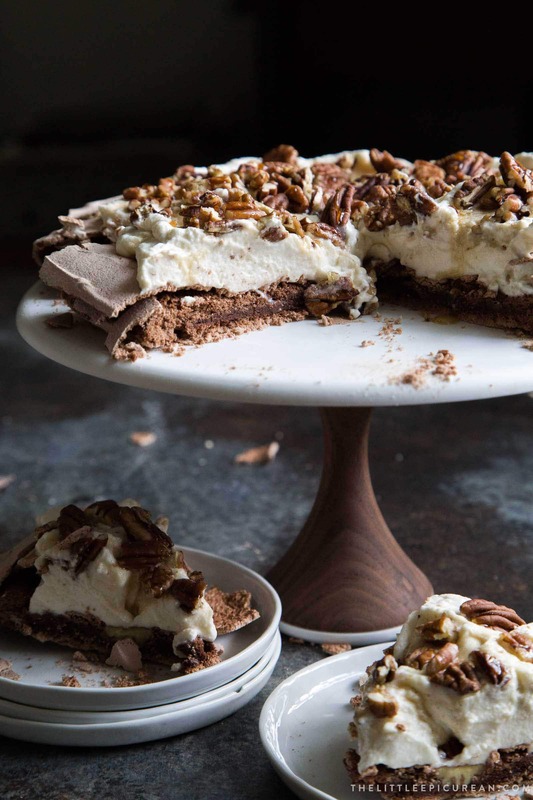 This chocolate pavlova can be made up to two days in advance. Store it at room temperature and simply top it with whipped cream right before serving. Nothing beats fresh whipped cream. Stay away from the whipped cream (or whipped topping) sold in cans and tubs. You simply need a whisk (I love this new whisk from GIR which you can support on Kickstarter right now!) and chilled heavy cream. Even if I use an electric hand mixer to make whipped cream, I like to finish it with a regular whisk to ensure the whipped cream isn’t over whipped. You don’t want over whipped whipped cream. It’ll still taste good, but it’ll be a little rough and curdled instead of soft and creamy. Traditional pavlovas will be fluffier and pillowy on the inside. The trace amount of fat in the unsweetened cocoa powder limited the fluffiness. It does however contribute a whole lot of flavor. 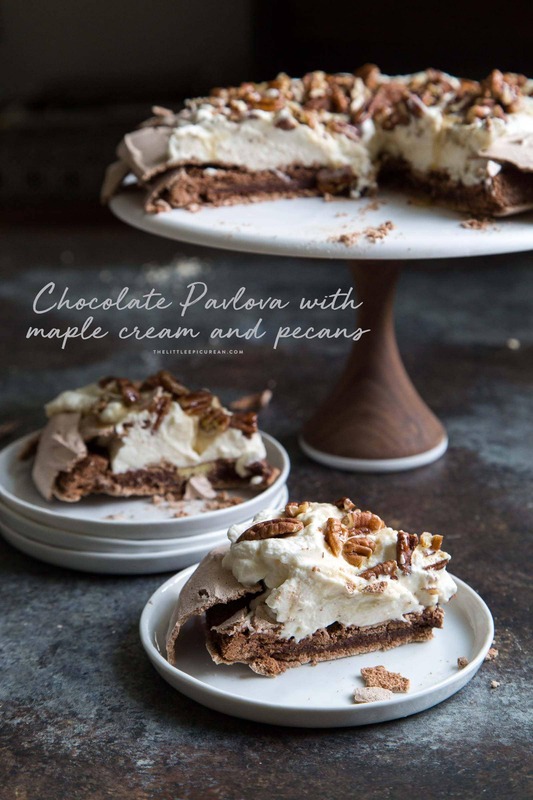 This chocolate pavlova tastes like a brownie (without all the added richness of the butter and whole eggs). 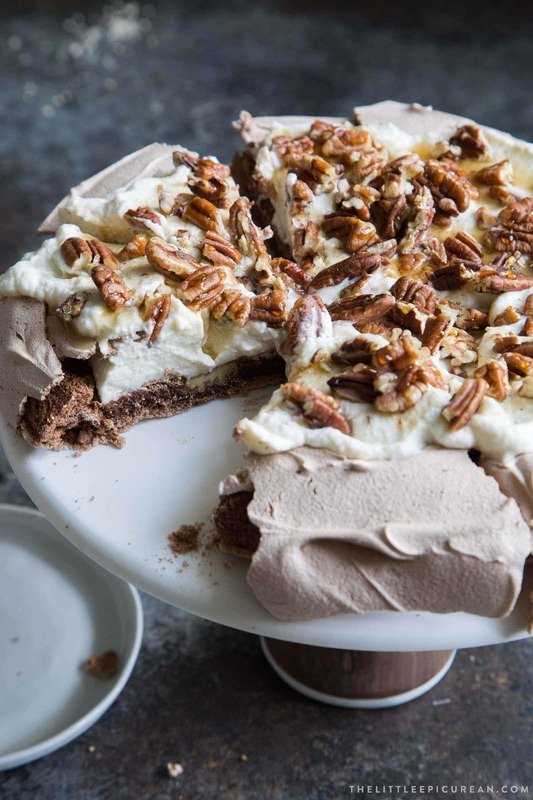 Topped with the maple sweetened whipped cream and toasted pecans, this chocolate pavlova is perfect with a cup of warm tea or coffee. Don’t worry if the pavlova cracks or falls apart. Simply break up the pavlova and serve it as a layered parfait or Eton Mess. It will still taste delicious. Preheat oven to 300 degrees F. Line baking sheet with parchment paper. Trace 7-inch cake round on another piece of parchment paper. Cut out 9-inch square around traced circle. Place trace-side down on lined baking sheet. Set aside. 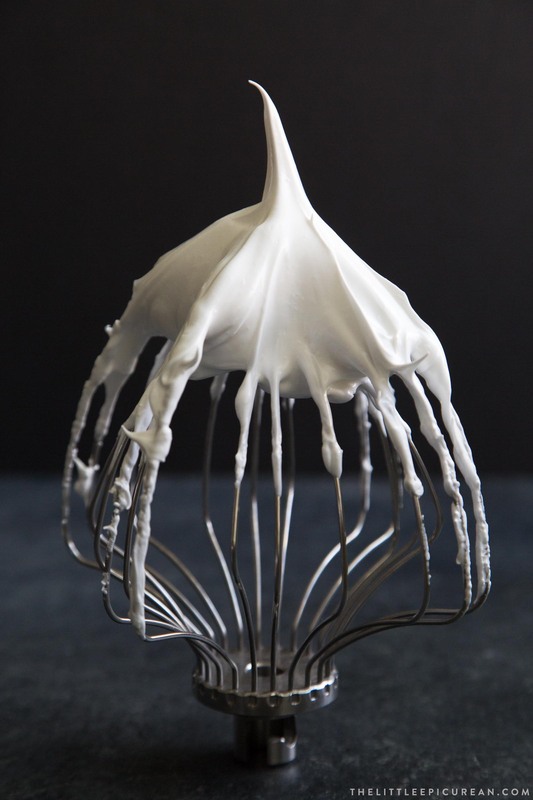 In the bowl of a stand mixer fitted with a whisk attachment, beat egg whites at medium speed until stiff peaks. Add sugar one tablespoon at a time. Once all the sugar has been added, increased speed to medium-high. Continue to beat until stiff peaks. At this point, meringue should be thick and glossy. Add cocoa powder, cornstarch, and vinegar. Fold in using a large spatula until there are no longer any streaks of cocoa powder. Dollop meringue on prepared baking sheet. Use a spoon or mini spatula to distribute meringue into a round mound, using the traced circle as guidelines. The cooked meringue will expand slightly out of traced circle. Bake 65-70 minutes. Do not open the oven during baking. After 60 minutes, open oven to check that meringue is dry on the outside. Turn off oven and allow to cool in oven for an hour. After one hour, prop oven door open using a wooden spoon and allow to cool for another 30-45 minutes. Pour chilled heavy cream and maple syrup into a cold mixing bowl. 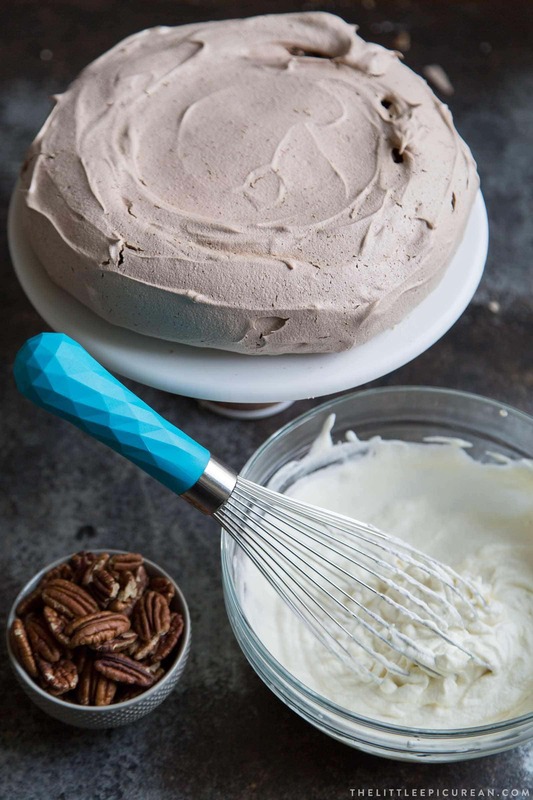 Use an electric hand mixer to whip cream to soft peaks. Switch to a whisk and continue beating cream to medium stiff peaks. Fold in pinch of salt. Use immediately or store in the fridge. Once pavlova has completed cooled, remove parchment square from lined baking sheet. Gently peel parchment from pavlova and place directly on serving plate. Just before serving, top pavlova with maple whipped cream. The top of the pavlova will crack and fall from the weight of the cream. Sprinkle toasted pecans on top and drizzle additional maple syrup, if desired. Serve immediately. Make sure egg whites are free from any traces of yolks, oils, or other contaminants. Cold eggs are easier to separate than room temperature eggs. Room temperature egg whites will whip stronger. Gradually add sugar one tablespoon at a time to ensure even incorporation and a stronger meringue. Do not open oven during the 60 minute baking time. Allow pavlova to completely cool. If the pavlova cracks and breaks, turn it into an Eton Mess or parfait. This looks so delicious! I definitely want to try it.